While I was enjoying the calm and relaxation of evenings at our Norfolk campsite I browsed 'Grow Organic', a book I was asked to review for the Dorling and Kindersley website, but which was good enough to warrant a mention here too. The book, as its title suggests, is an informative and practical guide to growing organically. Often organic gardening is linked to vegetable growing and whilst there was an interesting section about vegetables, the book also looks in detail at organic growing methods for woody plants, herbaceous plants, herbs, fruit and growing to attract wildlife. But the real strength of this book are the practical chapters which detail how to dig, how to water and how to weed, as well as good tips on composting and wormery techniques. There is also a very useful useful section about how to control garden pests organically. It is a focused book, easy to read, with really practical information and lovely photos. I would recommend it to new gardeners as well as more experienced gardeners looking to grow organically. Details of the book can be found on the Dorling and Kindersley website. Do take a look. Can't wait to check it out! And congratulations on what sounds like a fabulous holiday. It's so nice to get away -- especially when you have a friend to water the garden. 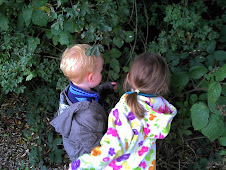 Kella's Musings on Growing Her Own, Wildlife and Her Brand of Parenting. The words and images contained within this blog remain the copyright and moral right of the author and cannot be reproduced without permission. In addition, the opinions expressed within this blog are those of the author and are not intended to cause harm to any group, organisation or individual. The author is not responsible for, nor will be held liable for any blog comments. Similarly, the author of this blog is not responsible for, nor will be held liable for the content of external websites.